SpaceX's first Falcon 9 Block 5 rocket rolls to its launch pad at NASA's Kennedy Space Center in Florida. SpaceX is set to debut the latest, most advanced version of its workhorse Falcon 9 rocket this Thursday (May 10). 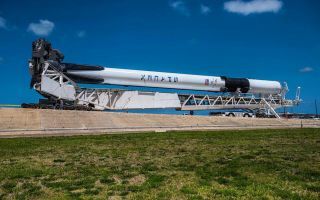 The company determined that its first Falcon 9 "Block 5" booster is ready to go, after analyzing data from a routine prelaunch static-fire test that occurred Friday (May 4) at historic Launch Pad 39A at NASA's Kennedy Space Center in Florida. Bangabandhu 1 is a communications satellite that SpaceX is launching for the government of Bangladesh. The two-stage Block 5 Falcon 9 is designed to take reusability to new heights. SpaceX has landed and re-flown numerous Falcon 9 first stages over the past few years, but none of these individual boosters has launched more than twice. Block 5 first stages, however, are designed to fly 10 times with just inspections between landing and liftoff, and 100 times with some refurbishment involved, SpaceX representatives have said. "Block 5 basically summarizes all that we learned on reusability," Hans Koenigsmann, SpaceX vice president of build and flight reliability, said last month during a news conference before the launch of NASA's Transiting Exoplanet Survey Satellite, which lifted off atop a Falcon 9 Block 4. "It's a reliability upgrade that combines reliability and reusability." When asked to provide an example of one of the Block 5's improvements, Koenigsmann cited materials in the first stage's heat shield, near the engine base. "But there's a lot of details here that are very technical," he added. The Block 5 has also been designed to meet NASA's crew-carrying requirements. Like Boeing, SpaceX holds a contract to ferry agency astronauts to and from the International Space Station; such flights could begin in the next year or so. Reusability is key to SpaceX's long-term vision, which involves helping humanity become a multiplanet species. Full and rapid reuse of rockets and spacecraft could eventually slash the cost of spaceflight enough to make such ambitious goals economically feasible, company founder and CEO Elon Musk has said. SpaceX has Mars in its sights. The company is developing a huge, reusable rocket-spaceship combo called the BFR, which Musk envisions helping set up a million-person city on the Red Planet in the next 50 years or so. If everything goes well, the first BFR flights to Mars could lift off in the mid-2020s, SpaceX representatives have said. The BFR will also be capable of launching satellites to Earth orbit, taking people on superfast "point-to-point" trips around the planet and doing pretty much everything else that SpaceX needs to do. Indeed, SpaceX plans to phase out all of its spaceflight systems except the BFR over time, Musk has said. Editor's note: This story was updated at 5:10 p.m. EDT to include the targeted launch date of May 10.